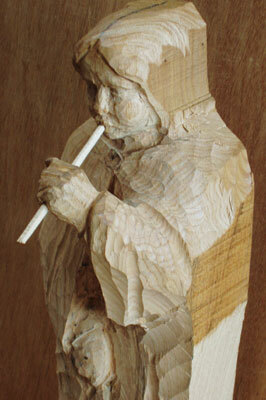 An area of woodcarving that may cause you a problem is carving a piece of work that requires an insert, such as a figure with its hand holding a staff or rod. Most part time carvers will usually complete the hand and then drill a hole to insert the object it is required to hold. If you are very lucky you'll get away with it, but what usually happens is that the hole passes through part or some of the fingers. A more dependable way is to rough out the hand so it is in position on the figure, remembering that the hand will be larger holding an object than just a clenched fist. You must not complete the hand, and leave an amount of extra wood for adjustment. You can then drill the hole at the required diameter; this is usually a two person exercise because 'sighting' the orientation of the drill bit - and hence the object to be held - needs to be viewed from different angles simultaneously. 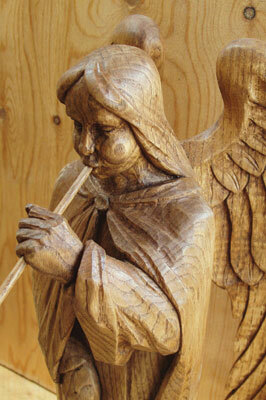 The photograph shows an angel carved in oak holding and blowing a horn. The figure is 445mm tall and is positioned on the top of an organ case to be installed in an American church, so it is predominantly seen from the front and below - hence it is only detailed at the front. The wings were carved and fixed separately for practicality and the time taken for the work was 50 hours including the production of the maquette. 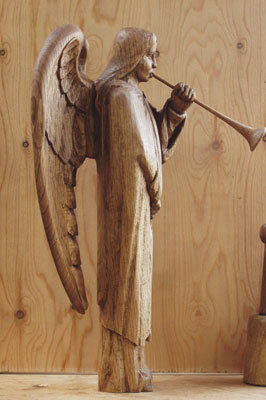 To be convincing, the horn needs to be touching the angel's lips to give the illusion of blowing the horn. This is obvious I know, but you don't want to end up poking the angel's eye out! The approximate position of the hand and face has to be determined and located in the wood; usually producing a maquette - a clay model - will help. 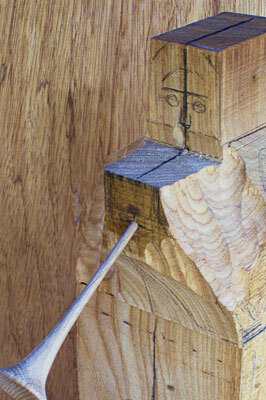 Then drill the correct sized hole through what will be the hand and align it to what will be the pursed lips. 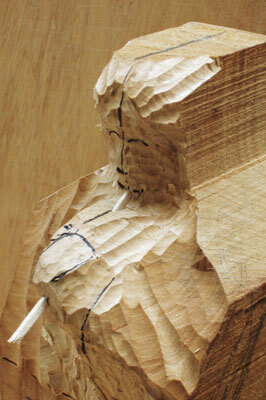 Insert the dummy piece of wood 'former' and proceed to carve the hand and lips. Please be aware as described in my last article that nothing is cut from behind any of the angel's features when viewed from the front until the front view is defined, this allows for any repositioning. This means that behind the hand and head are off limits for now. When all is in position and looking good from the front, you may continue to work behind the hand. Finalise the face by working away from the lips as these are fixed and cannot be moved. The rest of the figure can be completed but everything must be relative to the hand and lips. It is of course far more difficult trying to incorporate two related features holding or touching an object, but following this procedure does help, and is a practical method that will help with your carving if you adopt it.